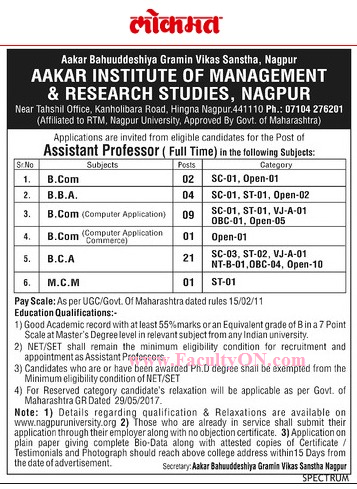 Aakar Institute of Management & Research Studies, Nagpur has advertised in LOKMAT newspaper for recruitment of Assistant Professor jobs vacancies. Interested and eligible job aspirants are requested to apply within 15 days from 07th April 2018. Check out further more details below. About College: Not available now. Will be updated later if it is avaialble. How to Apply: Interested and eligible persons are required to send their application on plain paper giving full details along with attested copies of degree / diploma certificates, experience certificate and recent PP size photo to the postal address provided below.